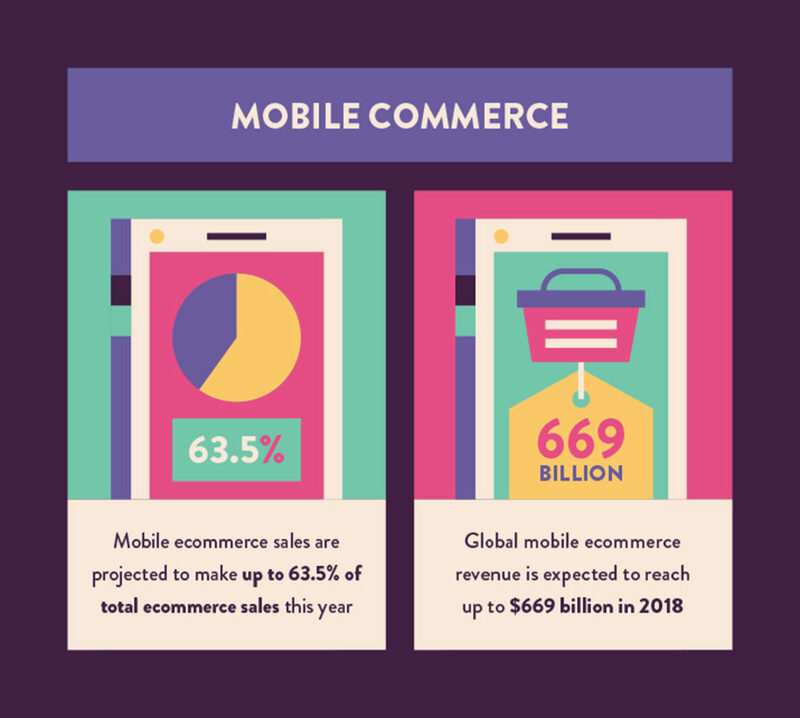 Staying up to date with ecommerce and online shopping trends is essential for any online business in 2019. With so many shoppers scouring the internet for the best deals to save them time and money, you need to make sure your website offers the best user experience possible. So, what trends are the most crucial for your business? Mobile continues to be an increasingly important factor, and omnichannel shopping is becoming more prevalent as well. Other areas of note are video and image search, voice search and influencer marketing, which is said to be one of the fastest-growing customer acquisition methods on the internet. It might sound a bit overwhelming, but that’s because baby boomers, millennials and Gen Zers alike all engage with online shopping differently. To be sure you’re not missing out on any lucrative opportunities, staying up to date with the latest ecommerce dialogue is a must. Searchers are more savvy than ever, and can spot a site that isn’t up to date with its design and user experience. To give the user the best experience possible, webmasters and digital teams are constantly testing and tweaking their sites to ensure all pages are optimized. A fundamental understanding of how your customers navigate your funnel is essential to increasing conversions. To implement such analysis effectively, you need to learn how your customers interact with your website, and determine what you can do to make their experience more seamless and enjoyable. Try running heatmap testing to see where users are spending most of their time on your pages. 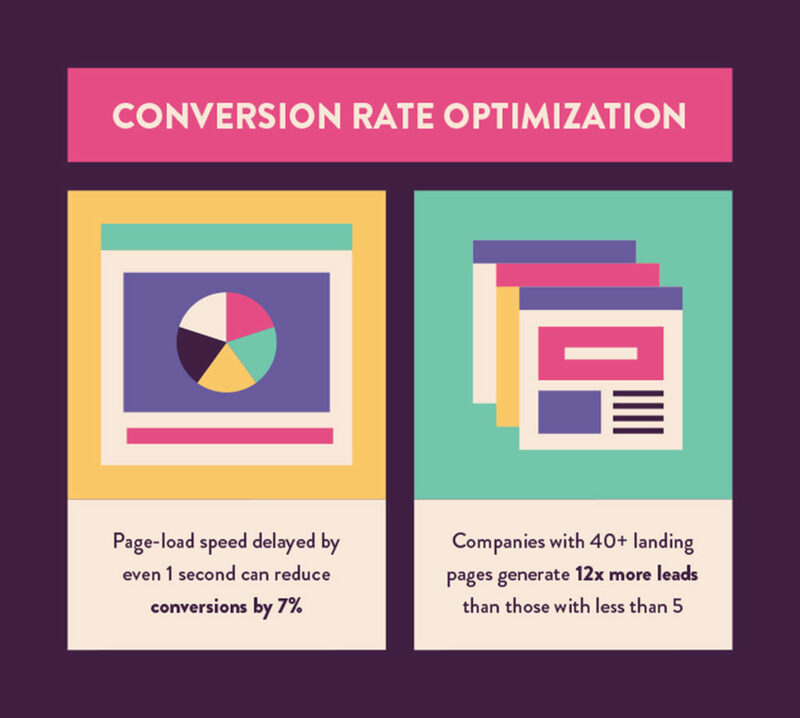 You can also run A/B tests to see if certain copy or design changes drive more conversions than others. Mobile users are on the rise. As Google continues to unfurl and improve Mobile First indexing, online companies should always keep in mind their mobile experience when creating new web pages. Pages should look identical and flow seamlessly on mobile devices. All of your web pages should be optimized for mobile. A poor mobile experience will hurt your ranking ability and could cost you sales. Users are prone to bouncing off of sites with slow loading times and poorly designed mobile pages. There are several guidelines outlined by Google about how you should design a site for mobile users. In the end, your goal should be to make things easier for the user. To improve your mobile experience, convert key product and sales pages to Accelerated Mobile Pages (AMP) and make sure CTAs are prominently placed so that they are easy to see and press while scrolling. 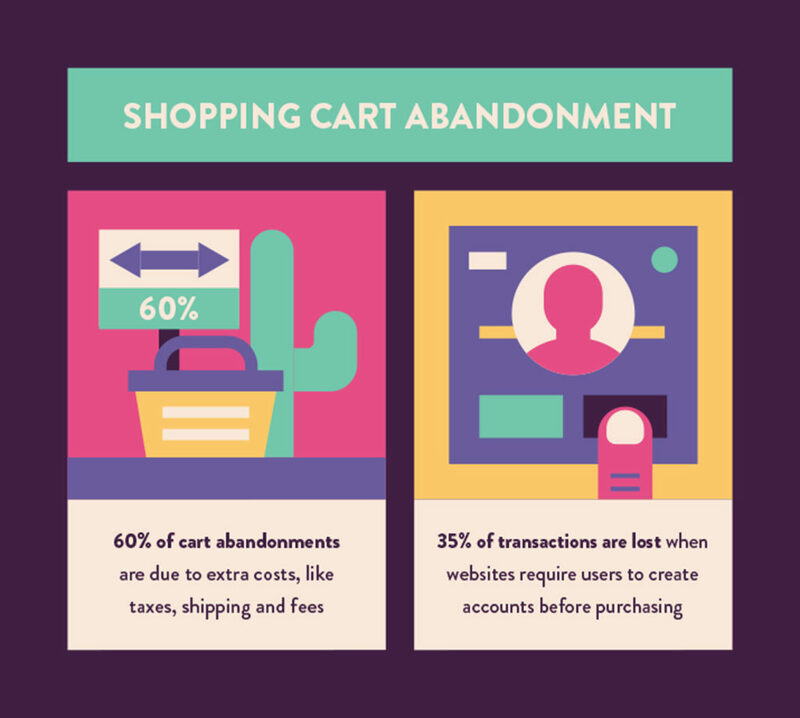 Shopping cart abandonment has always been an issue. As users continue to shift to online shopping, companies have tried various techniques for keeping users from leaving a full cart without purchasing. Shopping cart abandonment is bound to happen. Many users add items to the cart with no intention to buy, while others may be comparing your prices to other vendors. 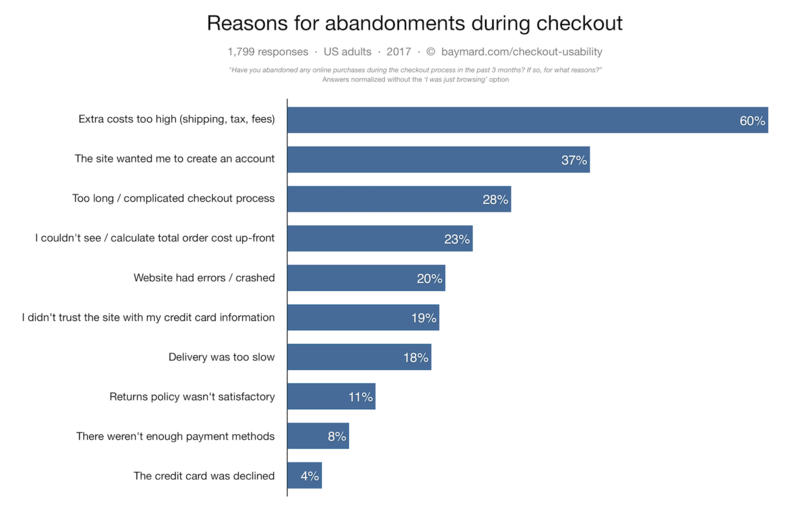 What you should be worried about is how many of those abandonment cases are due to a poor checkout experience. Users generally don’t like creating accounts before purchasing, and many will abandon their cart once shipping costs and taxes are factored in. To avoid losing sales, offer several types of payment options and make sure there as few steps as possible. Another tactic is an email reminder when users leave things in their cart to remind them to buy. 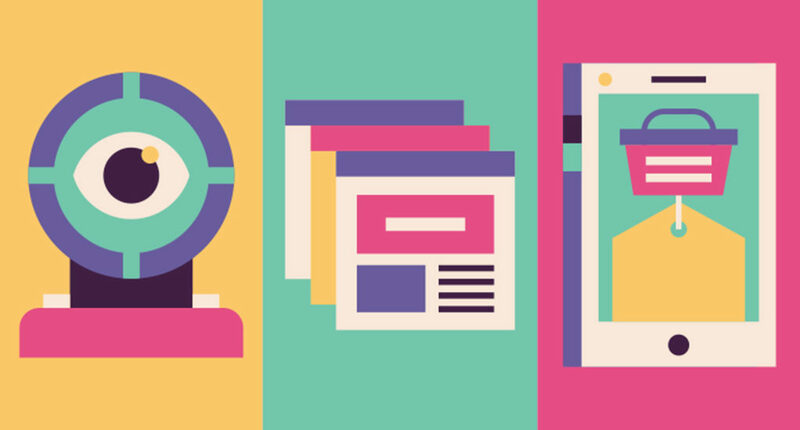 By 2019, total display and ad spending is expected to surpass search by 28 percent. Why the sudden surge? 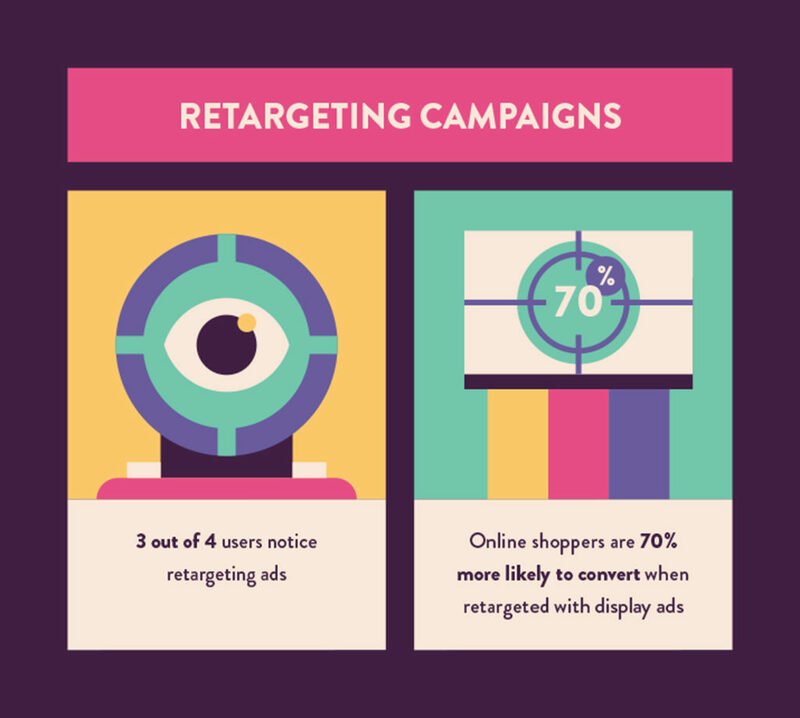 Marketers are just now realizing the potential in remarketing: Conversions increase the more a user has seen an ad. Retargeted display ads and email campaigns are some of the best methods to rekindling relationships with former customers. One proven tactic is to offer discounts in your retargeting emails, making sure to include the promotion in your subject line. It’s also a best practice to retarget current customers. This keeps them in the loop about promotions and prevents them from switching to a competitor in the future. 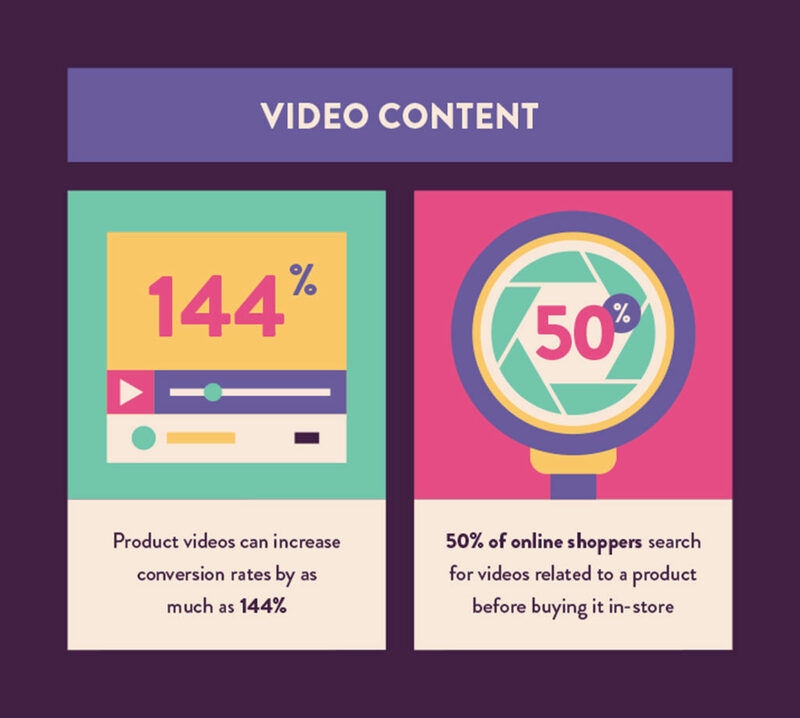 Video content is eye-catching and can showcase your products in real time. Users prefer this experience, as it allows them to visualize owning the product before purchasing it. Users also like to compare products online, so having multiple angles of a product, or a demo video of how it functions, is preferred. Video is a must for increasing brand awareness and conversions. Visual content tends to perform the best in terms of shares, and it also has the potential to increase referral traffic to your site when shared on social media platforms. For the best results, invest in producing high-quality video content, post it regularly both on your website and social channels and track how your audience reacts to your content. 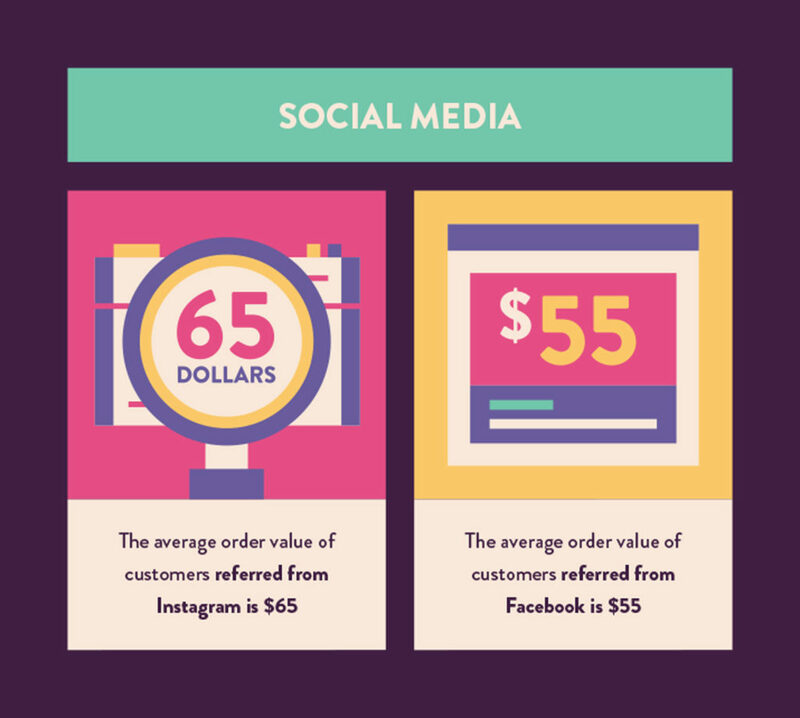 Social media is a great way to increase referral traffic and conversions for brands that have learned to use it properly. The key is to determine which social platforms work best for your industry. Brands that thrive off of visual content do well on Pinterest or Instagram, for example. Social media is a great way to build brand awareness. For the best results, analyze what competitors are doing to see which channels garner the most responses from your target audience. Once you’ve figured out your areas of focus, develop a content calendar so you’re regularly updating your social media accounts. 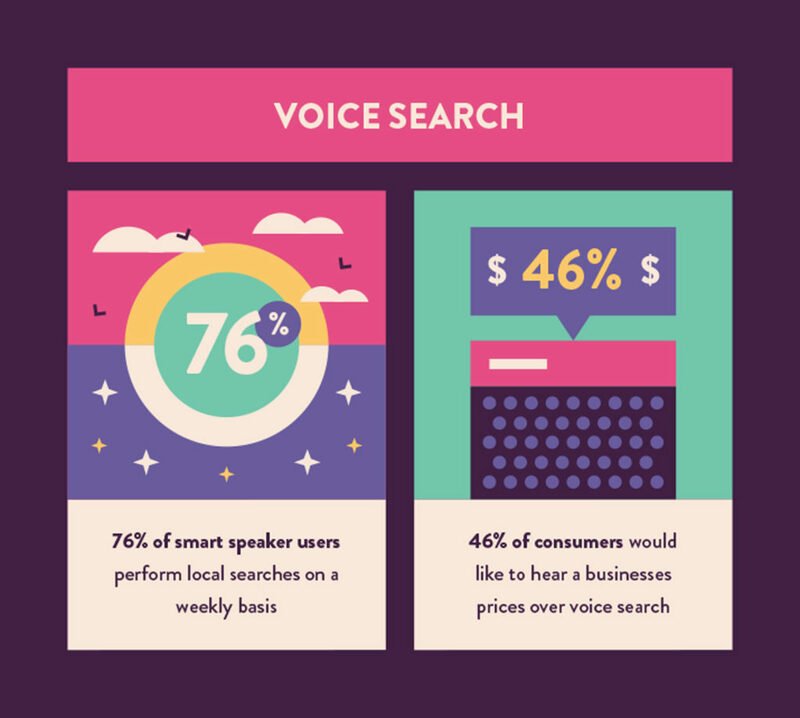 Voice search is projected to become the preferred search method in the coming years. Though far from perfect, users are growing more accustomed to voice search because of the prevalence of smart speaker devices in homes, voice search options on smartphones and machine learning, which allows smart devices to better anticipate searcher intent over time. Voice search is becoming more popular as voice-first devices and voice search for smartphones become more sophisticated. Siri alone handles 1 billion voice search queries a week, and a large portion (22 percent) of those searches are local. To optimize for voice search, you need to think of “conversational” long-tail keywords that pertain to your business and have a section of your FAQ page dedicated to answering those queries. 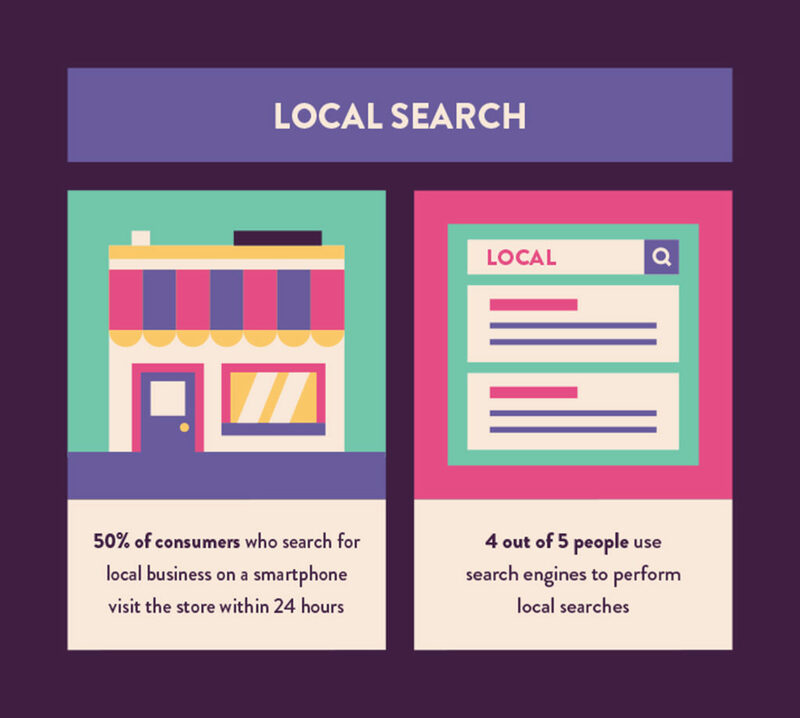 Local search and omnichannel shopping go hand in hand. Many shoppers are beginning their purchasing journey online to research a product before buying it in-person at a brick-and-mortar location. As a local business, it’s more important than ever to have an online presence. Users often compare products online before heading in-store to purchase them. Still, other users might prefer to shop local and purchase online, while others solely prefer the in-store experience. Whatever the case, the advantage of having both an in-store and online clientele is that your business can cater to baby boomers, millennials and Gen Zers alike. The CRM industry is worth $36 billion. 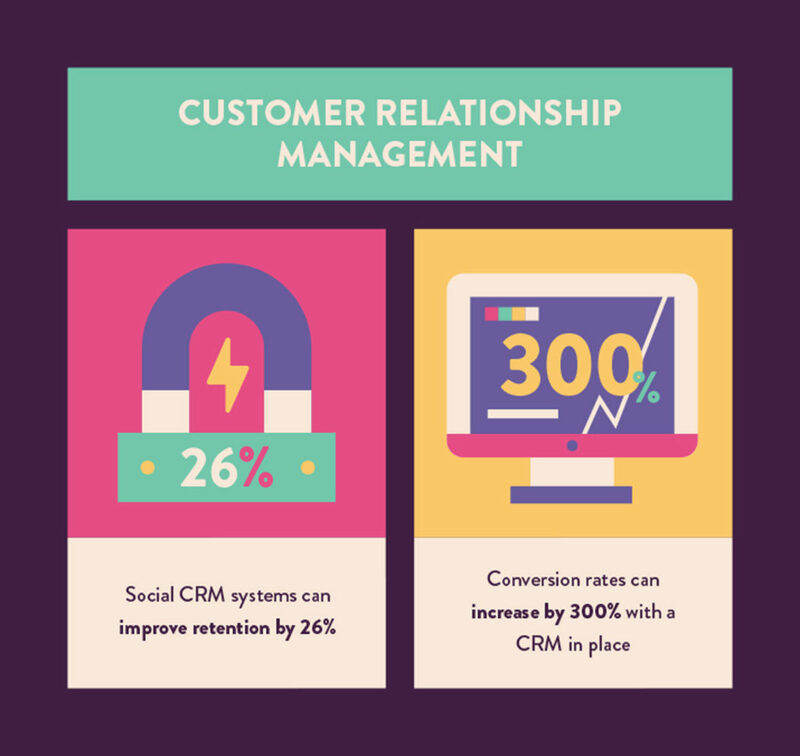 CRM software makes it easier for companies to stay up to date on customer relationships in every area of the purchasing funnel. With such a comprehensive resource at hand, it’s difficult for customers to fall between the cracks. CRM software provides the best means to centralize all of your interactions with previous, current and potential customers in one place. By allowing you to monitor each step and phase of the customer journey on an individual basis, you significantly increase your chances of capturing and converting leads while improving retention. With the emergence and maturation of real-time platforms like Snapchat, Instagram and Twitter over the last few years, influencer marketing has become a truly effective way to sell a product. Users have begun to place more stock in Instagram and Youtube influencers in particular, compared to celebrities, since these internet stars are more relatable. 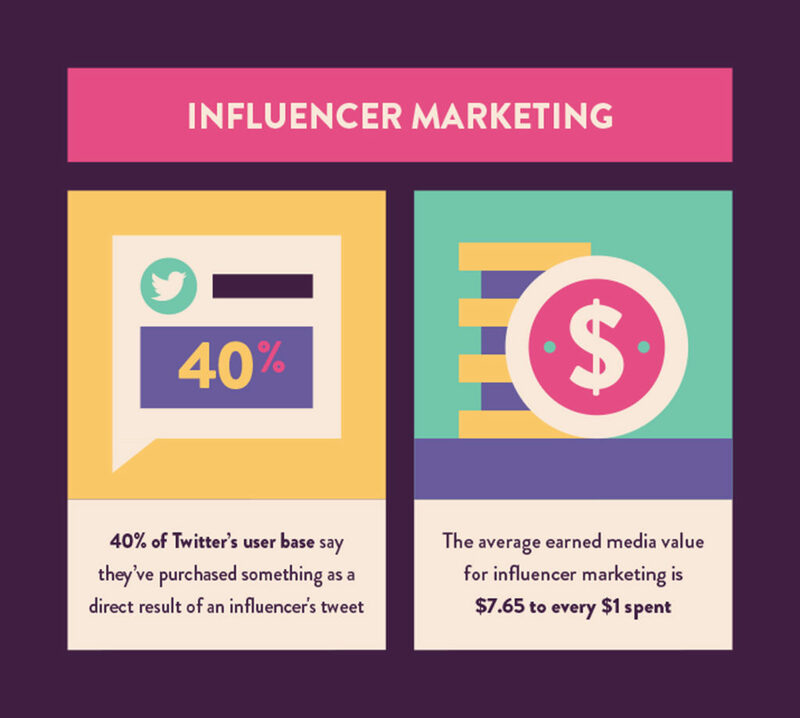 The main benefit of influencer marketing is that ROI is easy to trace. As seen in the stats above, many users purchase products as a direct result of a favorable review from an acclaimed influencer. These have sometimes backfired for brands, so always be careful to choose an influencer that can follow direction from your brand. The future of shopping is online. Shoppers of all ages have higher expectations than they used to, and the only way to cater to different age groups and preferences is to ensure your site is convenient and trustworthy. Give your users the best experience possible and you’ll the reap the benefits later.